I have many favourite books to read aloud, and enjoy reading my own picture books because it’s wonderful to see something I’ve written bringing joy to kids. 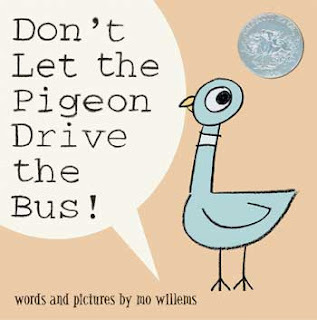 But my favourite read aloud (for today, anyway) is Mo Willems’ Don’t Let The Pigeon Drive the Bus. I love this book because it encourages interactivity. I have read it to school groups many times and have never had to prompt the children to say ‘no’ to the pigeon as he begs and pleads to be allowed to drive the bus. I am not the only teacher who loves this book, and I was delighted at school last year to see a year one boy with no literacy skills clutching the book to his chest. His teacher had read it to him and he simply loved it. Loving a book can be the difference between learning to read it (and, consequently other books) or remaining a non-reader. My all time favourite book, which I read to my first four children (who are all teens now) and continue to read to my seven-year- old is: The Little Witch Sisters, by Stephanie Calmenson, pictures by R.W. Alley, published by Grosset and Dunlap. I love this book because it involves two sisters making magic together, with the underlying moral of helping eachother. It's a fun book because the spells are all in rhymes, and the pictures are very descriptive. One of the spells goes like this: "Achoo! Achoo! Achibbity-choo! Pumpkin powder I need you!" I started reading it to my first two daughters and I guess because the book is about sisters, they could really relate. In the beginning, the younger sister doesn't want to help out at all; but when the magic brew is ready she wants to have fun with making magic. That's when her sister decides to turn her into different animals to teach her a lesson. The little sister understands that she was no help at all and to fix things she decides to do all the cleaning up. Both sisters are happy and are then ready to go out and make magic together: "Ibbity, jibbity, bibbity faire. They made magic everywhere!" All my memories of this book are of my children and I snuggling close together before going to bed and repeating the rhymes over and over, instead of once like in the book. My kids even made up their own rhymes during the day, with Ibbity Jibbity ... in them. We had so many laughs with this book. Even today, my older daughters will make fun of the rhymes (I guess they still have good memories as well). I particularly like books to read aloud that have repetitions and rhymes. This helps children feel confident in joining in and participating out loud. It also promotes recognition of words. Best of all reading and repeating together is so much fun, and ultimately it's that feeling of closeness and bonding that children are looking for. That feeling is something they'll remember, and in turn they'll associate reading as something good, and special. My favorite read-aloud, or at least one of my favorite read-alouds, is Caps For Sale by Esphyr Slobodkina. I have memories of being read this story as child by the librarian at my elementary school during class visits to the library. I can remember the gestures, facial expression, and voice inflections she used throughout the story, and I find myself emulating her style when I read it to my students today.When reading this story aloud, make sure to use fully immerse yourself in the part of the peddler. Your read-aloud will only be successful if you go all out and truly act out the angry and frustrated emotions of the peddler. Also, I pretend to stack and/or feel the caps on my own head every time the story lists the various caps the peddler has on his head. I don’t think I’ve ever read this story to a group of children that didn’t love it! It’s silly, it’s interactive, and it’s memorable. All it takes is one reading, and they will ask for it again and again. I never get tired of reading it aloud. It’s my go-to read-aloud book. If you want a read-aloud story that will never fail you, Caps For Sale is your book! In what is bound to become a family favorite, Michael Rosen's We're Going on a Bear Hunt (Aladdin, 2003), based on the song of the same title, successfully captures the imagination of its readers by describing a family's search for, of all things, a bear. Wonderfully illustrated by Helen Oxenbury, whose work also includes Big Mama Makes the World and Farmer Duck, the story follows a father and his four young children (and their dog) who, emboldened by each other's company, brave nature's elements in the quest to find their mythical creature. Because of it's fun and whimsical tone, the reader may not at first anticipate that they might actually encounter a bear. But what a surprise when they do, forcing our young heroes to rush back home, hastily retracing their steps, the bear hot on their trail, until they reach the safety of their home (but don't forget to close that door!). We're Going on a Bear Hunt, with it's lighthearted prose, tickles the imagination and simply begs to be read aloud with its evocative descriptions of our young adventurers as they "splish splosh" across the river and "squelch squerch" though the mud. It encourages families to experience the journey together, feeding everyone's love for adventure and excitement, not to mention, of course, reading. My favorite book to read aloud is Bear Snores On by Karma Wilson. One by one, little critters sneak into a Bear's lair to warm up on a cold, winter night.The language is delightful and the meter is flawless. from the fluff cold snow. The rollicking rhythm make this story perfect for reading aloud, but the best part is that kids can easily chime in for the refrainBut the Bear snores on. This lines repeats at predictable intervals throughout the story and my kids love to yell it out. I often stop when I get to it, and let them say it on their own. This participation has given my kids confidence and has made them feel like "readers" at an early age. And then switch to a squeaky mouse voice, as Mouse offers a solution. I never tire of reading this charming book! In fact, I have read it so many times I can recite most of it by heart. And so can my preschoolers! Many thanks to all the contributors from Read Aloud Roundup (1) and (2).